Today Boris FX, a developer of integrated VFX and workflow technology for video and film, announced a partnership with Nexidia, a provider of audio analysis and dialogue search technology, to launch Boris Soundbite, a FCP plugin to locate footage by finding any word or phrase spoken in multimedia files (FCPX support coming soon). With the new Boris Soundbite, video editors, producers, and journalists will be able to instantly play all occurrences of a spoken phrase in their media, then insert the perfect take into their Final Cut Pro project, organize clips around keywords, and even find replacement words for problematic audio. 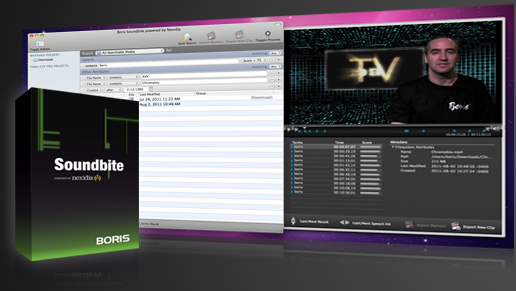 • Combine multiple phrases and standard Final Cut Pro metadata terms to search hundreds of hours of media in just seconds. • Preview results in the Soundbite player. Soundbite will search and play virtually any media file supported in QuickTime. • One click places selected clips into a Final Cut Pro project, including markers for each dialogue match and in/out points set in the Soundbite player. • Multiple languages and dialects are supported, including English, Spanish, French, German, Italian, and Dutch. Boris Soundbite will be available in September 2011 through the Boris FX worldwide reseller channel and direct from the Boris FX website for an introductory price of $295 USD. The introductory price will be offered for 30 days. Thereafter, the MSRP will be $495 USD. Owners of “AV3 Get for Final Cut Pro” will be eligible for a free upgrade to Soundbite. For more information, please contact Boris FX at info@borisfx.com or +1.617.451.9900. Check out the video below for a more detailed overview of Boris Soundbite.